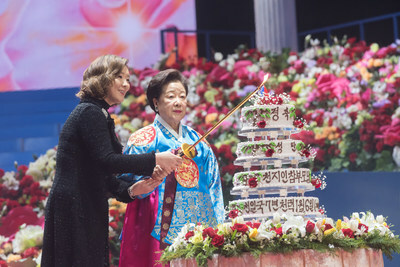 NEW YORK, Feb. 10, 2019 /PRNewswire/ -- Members of Family Federation for World Peace and Unification (colloquially known as the "Unification Church") from across the world gathered at the Cheongshim Peace World Center in South Korea to commemorate the founders' 76th birthday of Dr. Hak Ja Han Moon and her late husband's, Reverend Sun Myung Moon's, 99th birthday on February 10, 2019. Dr. and Rev. Moon have lead a lifelong journey toward building a global community and a culture of peace. Since her husband's passing in 2012, Dr. Hak Ja Han Moon has carried on his legacy and established a coalition of parliamentarians and religious leaders to create models for good governance and strengthen interfaith dialogue. Lovingly known as "Mother Moon" by members and friends of the Unification Movement, Dr. Moon is unique as one of the few prominent female leaders of a global religious movement. This past year, she completed a worldwide summit tour, addressing audiences in the thousands in Africa, Asia, Europe, and the Americas. During her speech at the 2018 Africa Summit in Senegal, Dr. Moon said, "The history of civilization and of Christianity until today has progressed centered on men. When we look at our present situation, which has developed centered on men, something is lacking. There is an imbalance." She continued, "The true family movement is the only shortcut to a world of peace and true families are the building blocks of the Kingdom of Heaven on Earth." Dr. Moon is challenging today's leaders to take responsibility for the prosperity and salvation of their people. "I ask all of you world leaders to become messiahs of your own nations," Dr. Moon proclaimed at the Universal Peace Federation's World Summit on February 8, 2019. Next year marks Rev. Moon's centennial. Celebrations are expected to take place around the world to honor the legacy of peace and reconciliation centering on a family movement that he and his wife built together over the past 50 years.